Telangana Tourism Presents Heli Ride to Medaram Jathara to take off soon is a never to be missed opportunity where you get a rare chance to explore the wonders of Medaram Jaathara. Helicopter service starts from: 14/02/2016 till 20th Feb 2016. Baggage Allowance: baggage of maximum 3kgs in addition to a regular-sized ladies handbag is allowed to be carried per passenger, free of cost. Note:Passengers with infants also intended to have ticket Passengers with infants less than 1 year to have half ticket; Passengers with infants more than one year should have full ticket. Passenger should reach1 hour prior to scheduled departure time. There will be random checks while boarding for hand baggage size and weight and if found oversized or overweight will be rejected. Changesin the bookings can be made only up to 4 hours prior to scheduled departure time. Indwell is not responsible for any losses incurred by the passengers. Indwell will not be liable in any way for delays/ cancellations/ diversions whether due to bad weather. Indwell reserves the right, without assigning any reason, to cancel or delay the commencement or continuance of the helicopter or to alter the stopping place or to deviate from the route of the journey or to change the type of aircraft in use without thereby incurring any liability in damages or otherwise to the passenger or any other person on any ground whatsoever. We strongly recommend passengers to provide correct phone number and email address to enable us to inform of flight delays or cancellations in unforeseen conditions. All passengers are required to carry valid proof of identification, including for children and infants required to carry either Passport or Voter's ID card only as proof of identification. 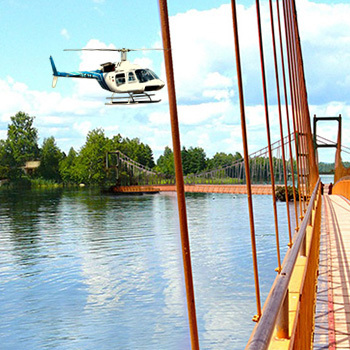 Helicopter schedules are subject to change and applicable regulatory approvals. Certain fares could carry a restriction related to change/cancellation and policy. Passengers are advised to compulsorily retain the ticket until exiting the terminal for security reasons. Sammakka Sarakka Jathara or Medaram Jathara is the largest tribal religious congregation in the country. 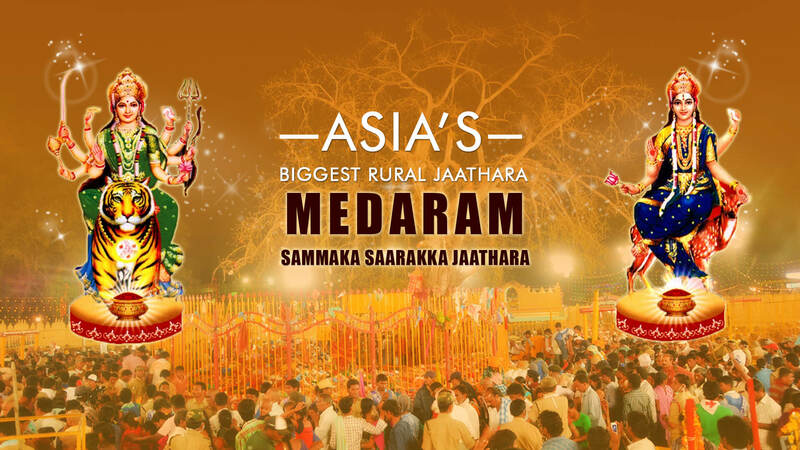 The biannual Jathara takes place at Medaram village of Tadvai Mandal in Warangal district, in Telangana region of Andhra Pradesh. Approximately one crore devotees are expected to take part this time at the Jathara to be held between February 12 to 15, 2014. A little festival of tribal’s in a small village has become a major pilgrimage in the last six years. This festival is held to get the blessings of goddesses Sammakka and Sarakka. It's believed that in those 3 to 4 days of the Jathara, goddesses’ real presence is felt. With the Jathara nearing, arrangements at Medaram village have also been picking up speed. It might be noted that about 80 lakh pilgrims had taken part in the Jathara last time. 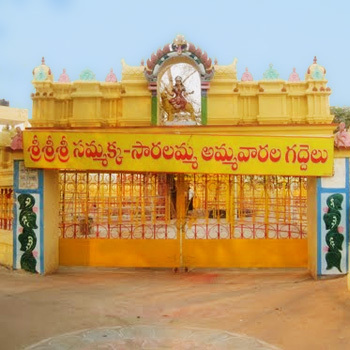 The Sammakka Jathara was declared as a state festival by Andhra Pradesh government in 1998. Devotees in large number from neighbouring districts and different states including Chhattisgarh, Madhya Pradesh, Odessa, Maharastra, Karnataka and Jharkand participate at the Jathara. People offer bangaram (gold) in the form of jaggery of a quantity equal to their weight to the goddesses and take holy bath in Jampanna Vagu (stream). It is a festival with no Vedic or Brahmanic influence. Jampanna Vagu is a tributary to River Godavari. According to the history, Jampanna is the tribal warrior and the son of Tribal Goddess Sammakka. The Jampanna vagu took his name as he died in a battle fighting against Kakatiyan Army in that stream. The Jampanna vagu is still red in colour believed to be with the blood of Jampanna (Scientifically the red colour of the water is attributed to the soil composition). Devotees believe that taking a holy dip in the red water of Jampanna Vagu reminds of the sacrifice of their gods who save them and also induces courage into their souls. The actual festival begins in the month of Magha, on Sudha Pournami (full moon day) evening when Sarakka (in the form of vermilion) would be traditionally brought from Kanneboyinapalle, a neibhouring village in the forest, and placed on a gadde, an earthen platform raised under a tree. By next sunset, the main goddess Sammakka (in the form of vermilion) will be brought from Chilukalagutta. There are two gaddes (platforms) separately one for goddess "Sammakka" and other for goddess "Sarakka". They are represented by bamboo sticks smeared with turmeric and vermilion (Pasupu and Kunkuma). Since time immemorial, there is a huge tree standing on Sammakka gadde. Hundreds of people who are often believed to be possessed by the goddess come here dancing ecstatically throughout their journey. People believe that Goddesses Sammakka, Saralamma fulfill their desires with their divine and miraculous powers.